Gregg Popovich won his 1,127th game with the Spurs with a win over the Philadelphia 76ers on Thursday night and tied Jerry Sloan for the most wins with a single franchise in NBA history. It’s been a true pleasure to watch the team during Pop’s tenure. May it last forever. The Spurs extended their win-streak over the Sixers to 11 overall and 12 at home. It’s been over 13 years since the Sixers won one in San Antonio on January 3rd, 2004. That’s quite a drought. Brett Brown has his team playing well lately, matching the Spurs’ 10-5 January for the fourth best record in the month in the NBA but the Sixers were unfortunate to catch the Spurs on Thursday night as the game was the second night of a back-to-back (known as a SEGABABA around these parts) and they were without their best player in Joel Embiid as well as missing Nerlens Noel and their minutes leader in Robert Covington. The Silver and Black weren’t whole either as Pau Gasol missed his eighth-straight game after breaking his hand on January 19th and LaMarcus Aldridge missed the game with a minor knee ailment. Davis Bertans and Dewayne Dedmon got the starts for the Spurs. The Sixers played the Spurs tough in the first half, outscoring the Spurs 32-24 in the second quarter to take a five-point lead into the break behind 16 points and seven rebounds from Ersan Ilyasova. Ilyasova scored seven points for Philly during a 14-2 run over three and a half minutes in the quarter as they took the lead from San Antonio and and built a 53-48 halftime advantage. 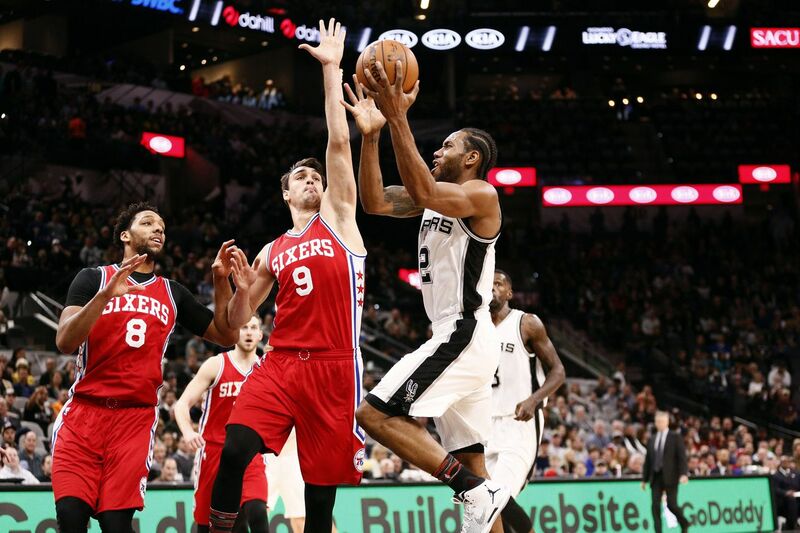 The Spurs returned to their usual dominant selves in the third quarter against the Philadelphia 76ers, outscoring the visitors in the period 31-20 to take a six-point lead into the final quarter. While it was nice to see the Spurs take over in the third one can’t help but think that the Sixers were a bit tired and undermanned. With the Sixers out of gas the Spurs were able to limit Philadelphia to just 13 points in the fourth, outscoring Philly by ten to make the final score look more lopsided than the contest was for the majority of the game. The Sixers scored just 33 points in the second half of the game. Brett Brown has done a remarkable job with his team, taking the Sixers from laughingstock of the league to fierce competitors in short time now that he has legitimate NBA players on Philadelphia’s roster. They’re only four-and-a-half games out of the eighth-seed at the moment and if they can continue their recent play it’s not impossible to imagine them sneaking into the playoffs. Your Spurs improve to 38-11 and get a little more cushion in the loss-column as the Houston Rockets lost to the Hawks tonight in Houston to fall to 36-17. The Warriors beat the Clippers and remain four-games ahead of San Antonio. The Spurs turned the ball over 19 times in the game. They were not sharp and were a little bit lucky to have caught Philly on a SEGABABA and without important pieces. The Spurs are now tied with the Warriors for the best defensive rating in the league at 101.4. The Spurs shot just 74.1% from the free throw line. They have hit 74.4% of their freebies over the past four games, down from what was a league-leading 81.7% in their first 45. They’ve also taken an average of seven more free throws per game in their last four. Seven players scored in double-figures for the Spurs with Kawhi’s 19 leading the way followed by Dewayne Dedmon’s 13, 12 each from Davis Bertans, Danny Green, Patty Mills, David Lee and Jonathon Simmons tossing in 11. The six other Spurs combined for 11 points. Neither team shot well from the field with Philly hitting 34% of their attempts and the Spurs knocking down 43% of theirs. The Spurs were especially bad from deep, going 6-for-21. The Spurs have scored over 100 points in 26-straight games. Tony Parker (35,541 minutes) passed Isiah Thomas in career minutes and is now 61st all-time and will most likely pass Wes Unseld, Nate Thurmond and Dennis Johnson to move into the top-60 this season. He’s currently 11th in all-time playoff minutes (7,480) and trails Bill Russell by 17 minutes. Dude’s played a whole lot of ball, especially for a 34-year old. Parker was 0-for-5 from the field but dished six helpers to zero turnovers in his 26 minutes. Kawhi Leonard was relatively quiet in this one but finished with a beauty of a line with 19-8-5-2-2. Dewayne Dedmon got back on the alley-oop train in this one with a little help from The Wee Frenchman. The Spurs get one more game at home before they head out on their annual Rodeo Road Trip when they host the Denver Nuggets on Saturday night. The Spurs might even get Pau Gasol back before the all-star break as his recovery is going well. The Rodeo Road Trip has historically been where the team starts to gel and put it all together as they ramp up for the postseason. With so many new guys on the squad it will certainly be a great opportunity for the team to get closer. I’m definitely excited about it.